It is my pleasure to welcome you to the website of the Permanent Mission of Republic of Cyprus to the United Nations, which provides useful information about Cyprus and our activities in the United Nations. Cyprus has been a member of the United Nations since its independence in 1960. Cyprus has always attached great emphasis to multilateralism and international law and is deeply committed to the values and principles enshrined in the UN Charter. 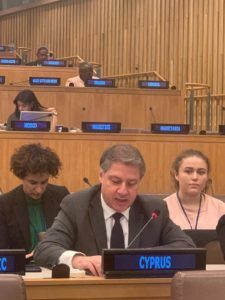 Actively engaged in the promotion of peace and security as well as the protection of human rights and cultural heritage, Cyprus strongly supports the central role of the United Nations in the maintenance of international peace. We are also determined to a peaceful solution to the Cyprus problem that will restore the unity of our country and will safeguard the independence, sovereignty and territorial integrity of the Republic of Cyprus and the respect of human rights and fundamental freedoms of all Cypriots. Cyprus, a member of the European Union since 2004, is also fully committed to the promotion of economic and social development, including the Sustainable Development Goals and wishes to play its part in addressing the main challenges of today such as climate change, poverty and gender equality. 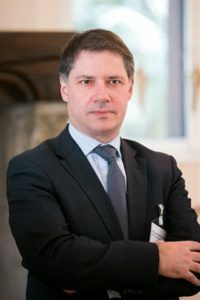 As a maritime nation and an island-state, Cyprus attributes particular emphasis to the respect of the Law of the Sea and the universally recognized principles and norms prescribed by UNCLOS. I thank you for your interest and I do hope that this website can serve as a window to Cyprus’ activities in the United Nations. It is a great honour to address the 63rd Session of the Commission on the Status of Womenices and sustainable infrastructure.